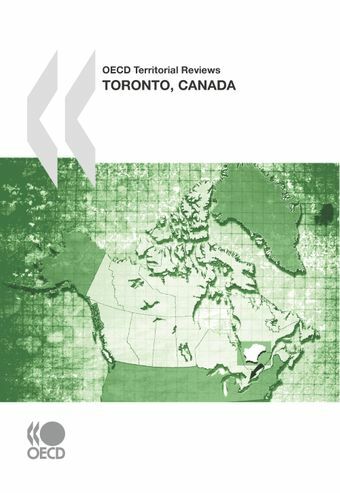 OECD's Territorial Review of Toronto, Canada. It finds that the Toronto region is one of the chief economic powerhouses of Canada, generating almost one-fifth of national GDP and 45% of Ontario’s GDP. The region is home to 40% of Canada’s business headquarters and is a main manufacturing hub, with major automotive, biomedical and electronics companies. Toronto is also one of the most diverse metropolitan regions in the world: half of its population is foreign born and it hosted 40% of all immigrants to Canada during 2001-2006.Nevertheless, the region’s current economic development model is under pressure and its economic performance has been mixed in recent years. From 1995 to 2005, GDP per capita and GDP growth rates were below the Canadian average while its annual economic and labour productivity growth were lower than the average for OECD metropolitan regions. During this period, population growth boosted demand in the construction, sales and retail, professional and financial services sectors. However, the recent decline in the area’s manufacturing jobs has illustrated the structural difficulties of some traditionally strong areas, such as the automotive and electronics industries.This Review proposes a new sustainable competitiveness agenda to enhance productivity, focusing on innovation, cultural diversity and infrastructure, as well as on green policies. To implement such an agenda, the Review proposes improving the current governance framework by intensifying strategic planning at the level of the Toronto region.